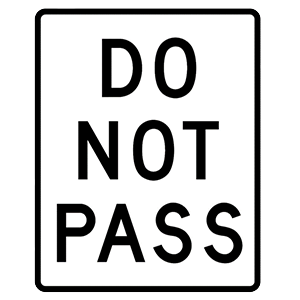 Your current roadway ends ahead. You must bear either right or left. 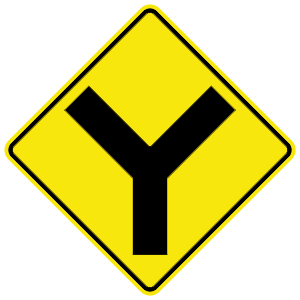 This sign indicates that there is a Y intersection ahead. You must bear either to the right or to the left. Drivers must be careful when passing large vehicles and should avoid driving beside large vehicles for long periods of time. Because large vehicles have large blind spots on both sides, you should avoid driving beside a large vehicle for a long period of time. It is safest for you to either drop back or move forward when you find yourself directly next to a large vehicle. 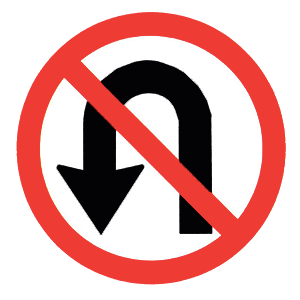 This sign indicates that U-turns are prohibited.